After a two-week tour, the Caravan for Land, Water and Seeds reached its final destination, Dakar, and handed over the Convergence book to the Senegalese Government, currently hosting the presidency of the Economic Community of West African States (ECOWAS). In the name of the Caravan, Samba Gueye, President of the Senegalese organisation CNCR, handed over the Convergence book to the Secretary General of Senegal’s Ministry of Integration. “Every day communities are denied access to their lands and water as these resources are privatised. To protect the rights of family farmers, to guarantee their access to land, water and peasant seeds, is a requirement for peace”, Ibrahima Coulibaly, President of the National coordination of peasants organisations (CNOP) in Mali, states. As echoed in the Convergence book, the Caravan calls on West African governments to protect natural resources from the exploitation of transnational corporations and other actors. Under the heading of ‘Ma terre – c’est ma vie!’ (‘My land – that’s my life!’), participants and supporters of the Caravan urge governments to back small-scale farmers, fishers, women and young people in their struggle towards the access to and control over natural resources. 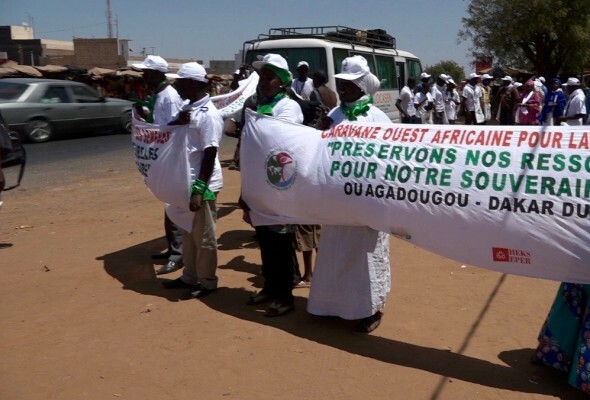 Departing from Burkina Faso on 3 March, the Caravan has counted with more than 200 participants from across 15 countries in the region, as well as reached out to thousands of people during local events and through regional and international media. “We are the Caravan of peace, of people’s integration in ECOWAS, of participative, inclusive and sustainable development”, Massa Koné, spokesperson from the Malian convergence against land grabbing (CMAT), says. Organised by the Global Convergence of Struggles for Land and Water, this event follows the declaration ‘Land and Water Rights, a common struggle’ an outcome of the subregional platform in West Africa, created in 2015 in Nyéléni, Mali, and key discussions at the World Social Forum in Tunis in 2015 and the African Social Forum in Dakar in 2014. FIAN International, together with other civil society organisations, has proactively supported the Caravan, as policies on land, water and seeds must primarily benefit the people and small-scale farmers. The Convergence Book is a tool developed by the Caravan, which lists both demands to authorities and alternative solutions regarding policies on land, water and seeds in West Africa. (available in French). The Global Convergence of Land and Water Struggles – West Africa is composed of more than 300 organisations and networks representing affected people of land and water grabbing in rural, peri-urban and urban areas; evictees of popular districts; youth; women and; NGOs from the 15 countries of the ECOWAS and the West African Economic and Monetary Union (UEMOA) spaces. Find the latest updates on the Caravan social media platforms on Facebook, Twitter and Flickr, as well as on YouTube. Photo: Caravaners arrive at Dakar, Geoff Arbourne.